Cleansing facial brushes are hotter than ever, but there are so many out there, that how do we know which one to get, and which one is the best for us?! Well, today we are going to break down the Clarisonic versus Foreo and which one is best for you. Clarisonic Versus Foreo, what is it? Clarisonic; Clarisonic goes beyond cleansing by using sonic technology to gently yet deeply cleanse pores without abrasion or harsh chemicals. Clarisonic removes six times more makeup than manual cleansing, cleansing so well that products absorb better – making skin more receptive to skincare ingredients. Foreo; The LUNA mini 2 is an enhanced T-Sonic™ face brush with eight adjustable intensities for a fully customizable cleansing experience. The updated 3-zone face brush is optimized for all skin types (comes in six colors). Clarisonic Versus Foreo, what do they claim? Clarisonic; With regular daily use Clarisonic reduces dry skin patches, oily areas and blemishes and immediately leaves skin feeling and looking smoother. Foreo; The revolutionary LUNA mini 2 sonic face brush eliminates blemish-causing impurities while remaining extremely gentle on the skin. All it takes is one minute twice a day for a fresh, clear and even-looking complexion. Clarisonic Versus Foreo, what are the specs? Clarisonic; Has 2 facial cleansing speeds – delicate & universal. Delicate for the AM, sensitive skin or winter. Universal speed for PM or to remove makeup, and to use before your anti-aging products. 1-minute T-Timer® feature. Foreo; The LUNA mini 2’s 3-zone face brush and the massager is now 50% larger and made with softer silicone for a cleansing experience. The T-Sonic pulsations deliver the unique ability to remove 99.5% of dirt and oil, as well as makeup residue and dead skin cells, massage and exfoliate without irritating the skin. 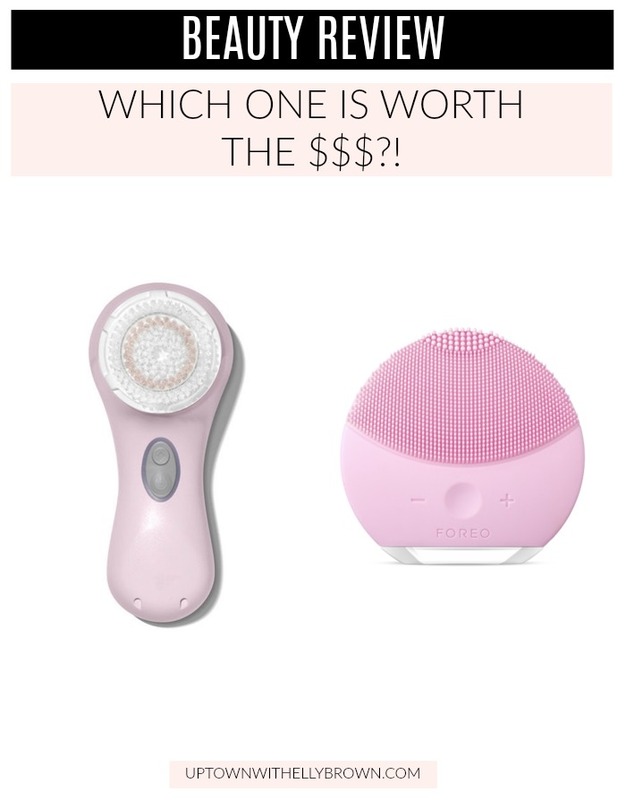 Clarisonic Versus Foreo, how much are they?! Clarisonic Versus Foreo, which one is best for your skin type? Clarisonic; Suitable for every skin type. You can customize your cleanse with different brush heads. Foreo; Suitable for every skin type. Choose from eight intensities to find what works for you. Clarisonic Versus Foreo, final thoughts? Clarisonic; I have had a Mia 2 for years, and even use my Mia Fit for travel. It does take up more space and the biggest drawback may be having to replace and buy a new brush every 3 months. That can get costly. Foreo; It’s small and compact. But because of the shape, I find it hard to clean areas like around my nose. Because of the medical grade silicone, Foreo is nonporous and naturally resistant to bacterial buildup. It’s easy to keep clean! Have you tried the mia 2 or the mini 2? What are your thoughts? Share them below. Thank you so much for stopping by, and make sure to see more of my beauty posts.